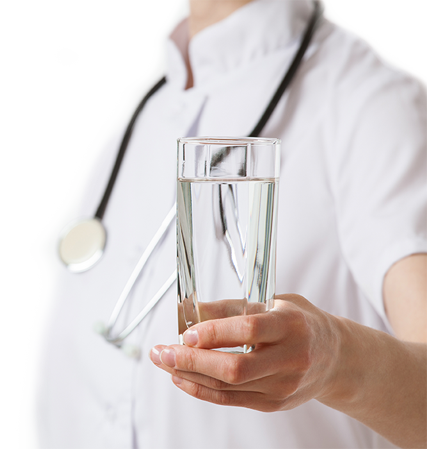 The average person might not think there’s much difference among bottled waters, but medical professionals and the people they treat know that steam-distilled water is the best. Free of minerals, chemicals, and other contaminants, it’s ideal for use in infant formula, with daily medications, and for those with chemical allergies. Le Bleu Ultra Pure Water doesn’t just taste better, it IS better for your body. Don’t just take our word for it, though. Read on for comments and recommendations from physicians and nutritionists. I would just like to inform your company of how pleased I am with your products. First, I started with the cooler tank that holds 5-gallon containers. I totally agree as a physician that this is the best water have ever tasted. I recommend it to my patients. I would like to be able to buy some small bottle waters to give to patients to take with their daily medications. When I decide to do this it will be a big order! My patients are very dear to me and I know that with each passing day their last visit may be their last. It’s a very hard profession but I love the people here in Eastern North Carolina (I’m originally from PA). I recommend Le Bleu Bottled Water to all my patients with chemical allergies. I’ve been drinking Le Bleu for several years, and it’s the only bottled water I would recommend to my friends and patients. Newton Quantz, Jr., MD, F.A.C.S. Distilled water is the purest form available. Distilled water helps to excrete excessive heavy materials from the body. My family has been drinking Le Bleu water for over four years. I believe it is important to drink the purest water possible. I believe the human body needs pure water. Le Bleu is the highest quality bottled water I’ve found. I enthusiastically and highly recommend Le Bleu Bottled Water to my patients and others interested in drinking water that is pure. Le Bleu is the purest bottled water I’ve found anywhere in the marketplace. Donald O. Alford, MD, F.A.C.S. There is only one water that is clean, and that is steam distilled water. No other substance on our planet does as much to keep us healthy and get us well. We believe that only steam distilled water should be consumed. There are hundreds of case histories of people who have overcome health problems when they began drinking distilled water. Dr. Clifford C. Dennison, Ed.D.